Surecrete’s Xtreme Series Cementitious Terrazzo casting mix with cutting-edge technology with modern fiber additive for concrete countertops and other applications looking for an exposed aggregate terrazzo look. 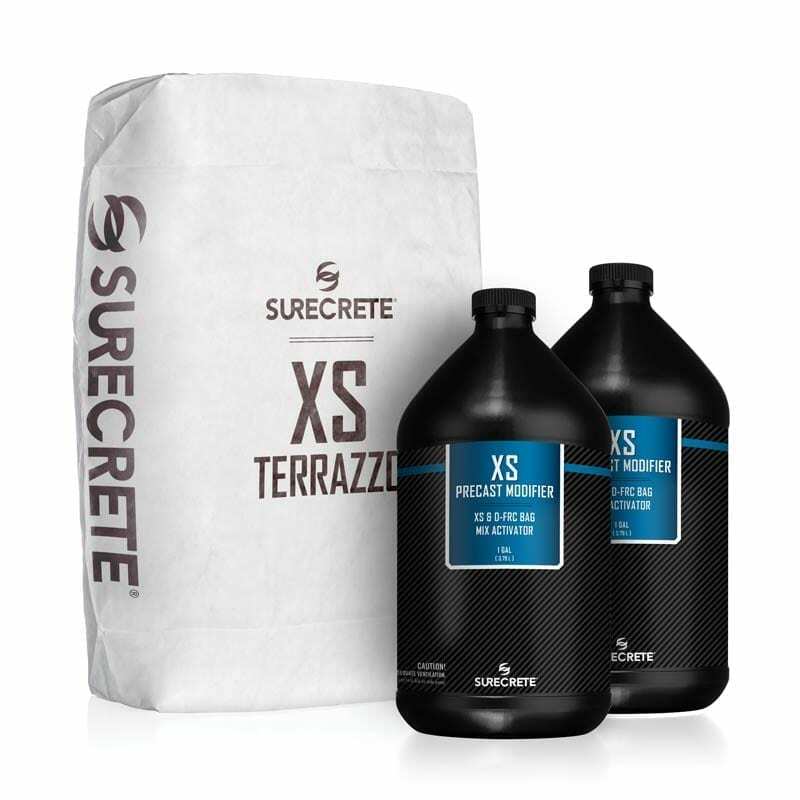 SureCrete’s XS Concrete terrazzo mix is a dual component precast concrete bag mix to which decorative aggregate is added and later exposed to create the unique, polished look of terrazzo. It greatly reduces the materials and labor required to construct traditional precast terrazzo. No reinforcement steel is needed, thinner precast pieces are routine, and quicker production times including grinding and polishing are accomplished. A stronger, denser and more flexible cementitious composite is created by combining cutting-edge technology with modern fiber advancements. With a broad range of coloring and the addition of decorative aggregate, design considerations are nearly limitless. XS Terrazzo produces concrete countertops, fireplace mantles and facades, shower surrounds, wall panels, furniture and many other architectural elements. This mix design provides the opportunity to earn “green” points by using recycled content (e.g. glass, granite, stone, etc.precat). XS Terrazzo was designed with the end user in mind. Without the pain, headaches and unnecessary mix formulation math that’s typically associated with casting a terrazzo or aggregate-filled concrete pieces, XS Terrazzo makes creating beautiful glass and stone aggregate precast concrete pieces simple and and easy to accomplish. With it’s increased strength, SureCrete’s Terrazzo mix allows for much larger pours and finished pieces without the worry of it becoming overly brittle as is typical with aggregate-filled concrete casted pieces. 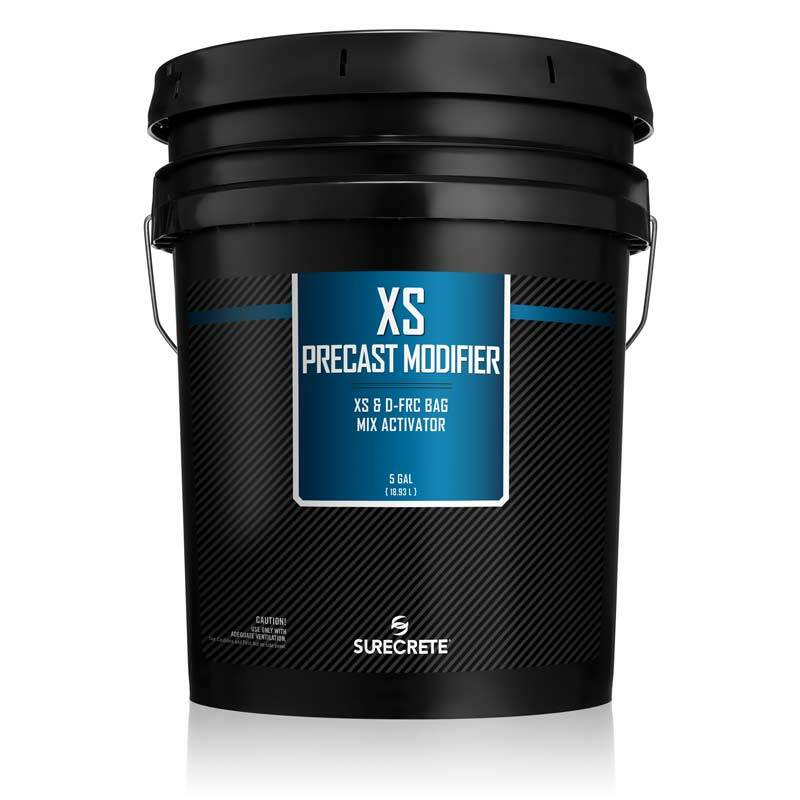 And with the de-mold times available through all of our Xtreme Series, those professional precast fabricators looking to create a multitude of precast terrazzo pieces without being slowed down by typical cast concrete set times. 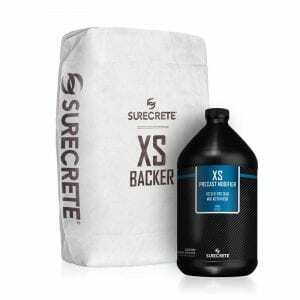 XS Terrazzo takes the guesswork and worries out of aggregate-filled concrete. 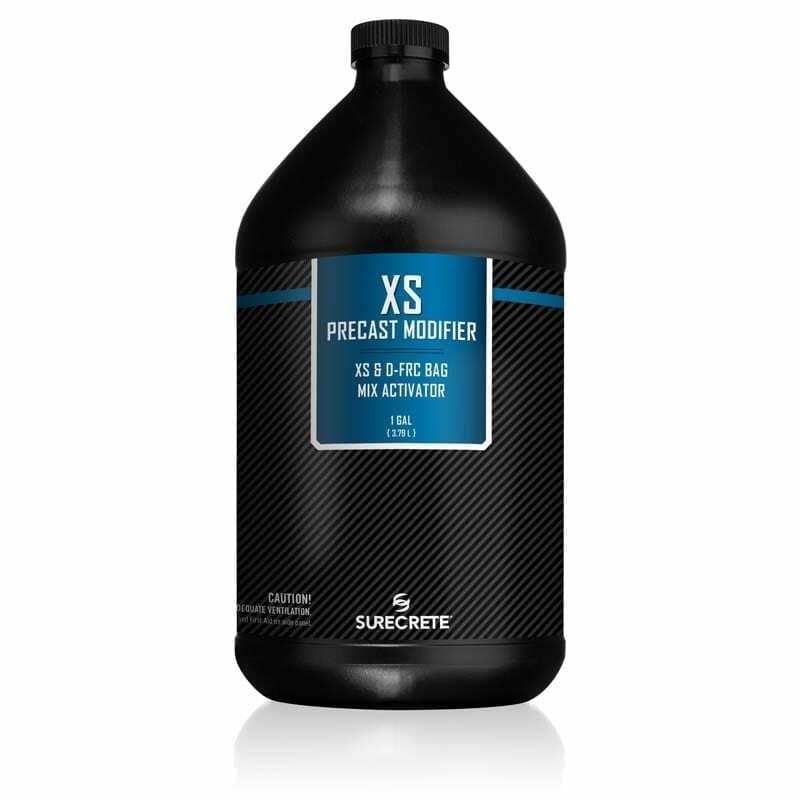 In a 10-gallon bucket, pour in both containers of XS Modifier and any powder colorants you want to use to integrally color your mix, and mix thoroughly, slowly adding the XS Precast dry contents from the bag. Slowly add in aggregate while mixing. 20% of the aggregate load must be fine aggregate, size 00 or smaller. In an upside-down, reversed mold on a flat surface (typically Melamine or a similar material is used as a base), simply pour in your freshly mixed XS Terrazzo to desired thickness. While wearing gloves, use your hands to push material around inside the mold to verify that there are no air pockets or voids. In warm weather, allow 4-6 hours before removing from the mold (in extremely cold temperatures or for a very thick pour, allow to set overnight). 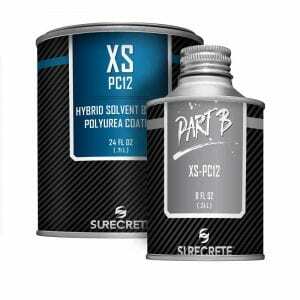 If there are any small pinholes in your surface, utilize our XS Slurry mix to fill. If you desire any additional color or accents, now would be the time to apply a stain like Eco-Stain. Terrazzo refers to an exposed aggregate in a cementitious or epoxy base, which has been ground to expose an added stone, glass, or other recycled materials, creating a one of a kind aesthetic appearance. The Terrazzo surface is then sealed or polished, depending on its intended use. Where can I find cement based Terrazzo in my home or commercial property? Cement based or concrete Terrazzo is very modern. Due to advancements in the ability to protect it properly with state of the art coatings, Terrazzo can be found in kitchens for countertops, focal points or back splashes; Bathrooms for shower walls, shower pans, wall tiles, vanities, sinks. The Xtreme Series Terrazzo is also finding its place in fireplaces, surrounds, mantels, hearths, entertainment centers. How do I maintain my cement based/concrete Terrazzo piece? Maintenance for your concrete terrazzo surface is very simple. Non-abrasive household cleaners that are already found in your home or business are all that are needed. Wiping you piece down every few months with SureCrete’s SureFinish will keep it looking brand new for years and years. Should the top become damaged or the surface jeopardized, resealing the surface is a non-invasive procedure. A typical 80 square foot kitchen requires a technician just a couple hours to prep and reseal an existing piece. That piece will then be out of commission for 24 hours until it can be put back into light duty use. How often will I have to reseal my cement based/concrete Terrazzo piece? 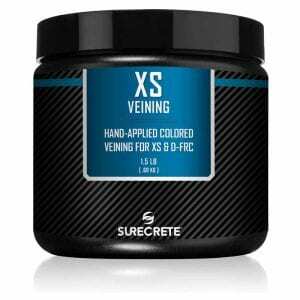 Chances are pretty good you will never have to reseal your Xtreme Series Terrazzo piece. There is a comforting feeling knowing the opportunity exists to be able to do so should it be deemed necessary. Unlike so many other surfacing solutions available, once the surface becomes jeopardized it must be replaced, this is not the case with the Xtreme Series Terrazzo.. .it can last a lifetime! Unprotected cement based or concrete Terrazzo can stain. A properly sealed Terrazzo countertop has a minuscule chance of becoming stained, which makes it a very popular choice. As with anything, proper care will ensure that your concrete terrazzo surface will last a lifetime. There are two methods of protecting Terrazzo; the first is a repellant which is recommended for non-work areas. This is the most common and typically what people are used to seeing as being called Terrazzo. The second method of protection is a film forming sealer. In this case, the sealer becomes a sacrificial coating, absorbing the brunt of the abuse and preventing staining; this is the most popular and preferred method of protecting any Terrazzo piece. Can I use XS Terrazzo in a Pour-In-Place project ? While it can be, there will likely be a significant amount of grinding/polishing required to expose aggregate on the design terrazzo surface. Can I grind and polish XS Terrazzo? Certainly! Just remember that if you still want to apply a sealer, we don’t suggest going any further than 400 grit. Can I use XS Terrazzo outside? Will the pieces I make freeze and break? In recent years the construction industry has begun to focus on the environmental impact of many building materials. The evaluation of products in the “green movement” encompasses many elements, which must be weighed on a scale of relative importance. These features include the longevity of the material, the composition, maintenance, recycled content, embodied energy, and the “cradle-to-grave” environmental impact. 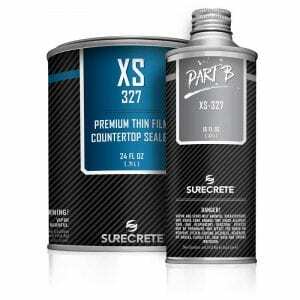 MRcr1.3 Building Reuse Credit (1 point possible) Xtreme Series Terrazzo countertops and wall panels typically last the life of the structure. In many renovation projects, the reuse of existing granite, marble, glass, and metals can be used to achieve 50% reuse. include recycled metal. The credit is based on the dollar value of the raw material. MRcr5.1 and 5.2 Local Regional Materials Credit (2 points possible) One point are awarded if 10% of the project building materials is extracted, harvested or recovered, as well as manufactured within a 500-mile radius of the project and the calculation is based on the cost of the raw materials. The natural stone chips like granite and marble along with glass aggregates are available throughout the United States. Terrazzo can contribute to the credit if the raw material supplier is located within 500 miles of the project site. A second point is awarded if the total percentage of the cost of local materials is at least 20%. Series Terrazzo systems are inorganic binders containing no Volatile Organic Compounds (VOC’s). 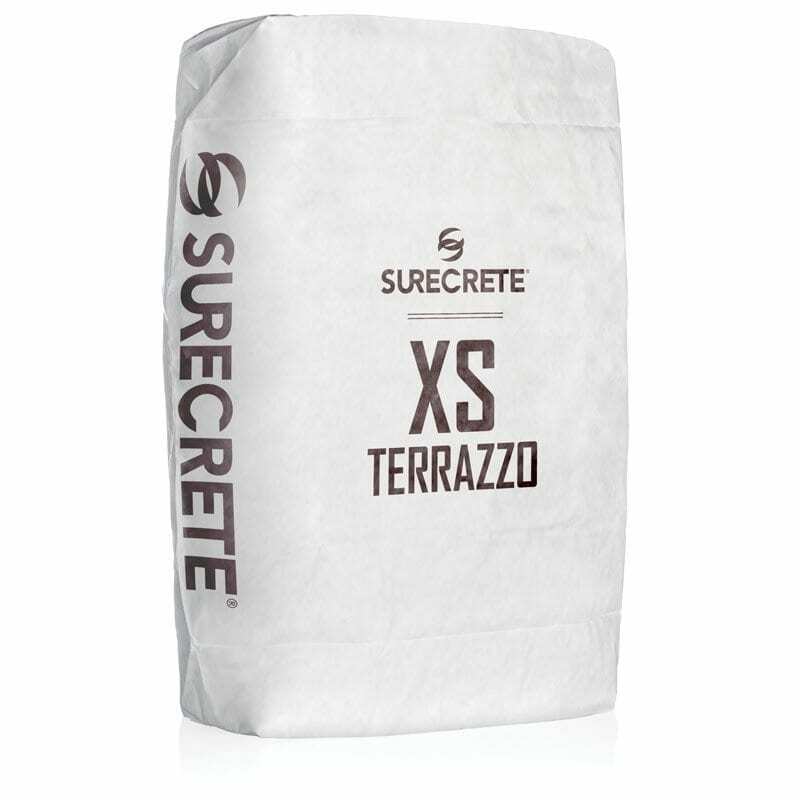 IDcr1 Innovative Design Credit (1 point) Xtreme Series Terrazzo can also potentially gain additional points under the Innovation and Design category for innovative performance in Green Building categories not specifically addressed by LEED. Extensive use of terrazzo as a predominant countertop or wall panel material can potentially result in an installation with a Life Cycle Analysis that exceeds that of other floor materials. Can I use XS Terrazzo in a Pour-In-Place project? While it can be, there will likely be a significant amount of grinding/polishing required to expose aggregate on the surface. You most definitely CAN use XS Terrazzo pieces outdoors. There is no fear of the pieces becoming brittle and breaking, even in freezing temperatures due to its extremely dense properties, and it’s ability to flex during the normal thawing process. Surecrete’s Xtreme Series Concrete Terrazzo casting mix with cutting-edge technology with modern fiber additive for concrete countertops and other applications looking for an exposed aggregate terrazzo look.